Contrary to common misconceptions, there is a wide range of metal roof colors and finishes, that can beautifully match any house style. 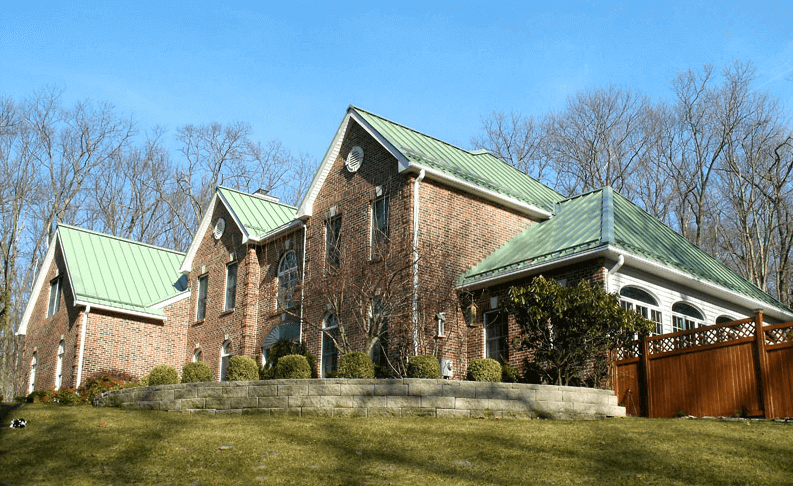 Since metal is a lifetime material, and your new roof will cost at least $9,000-11,000 you want to pick a color that you will be happy with for many years to come. 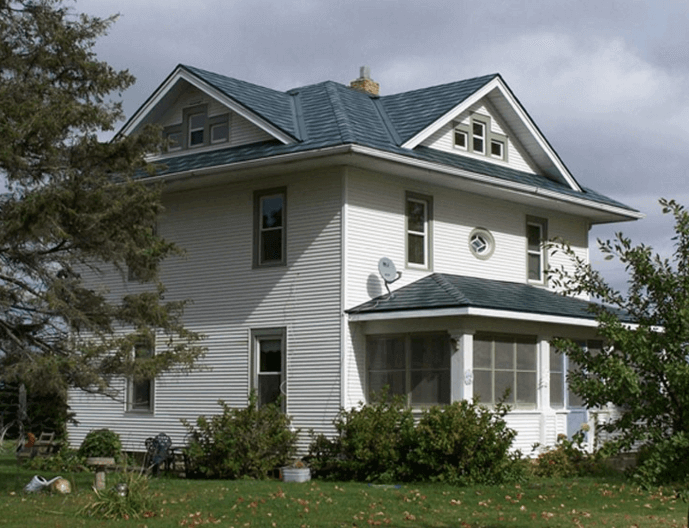 In addition to curb appeal, it is important to consider the quality of the metal roof paint. Choosing a budget vs. premium coating will have a direct impact on how your roof will look 10, 20, and 30 years down the line. There is a wide selection of pre-mixed or stock metal roof coating choices. These are the most budget-friendly and convenient, since they are readily available. However, while most standard roofing colors are similar across manufacturers, certain shades will vary. Something that is pre-mixed from one manufacturer, may have to be a special order from another. 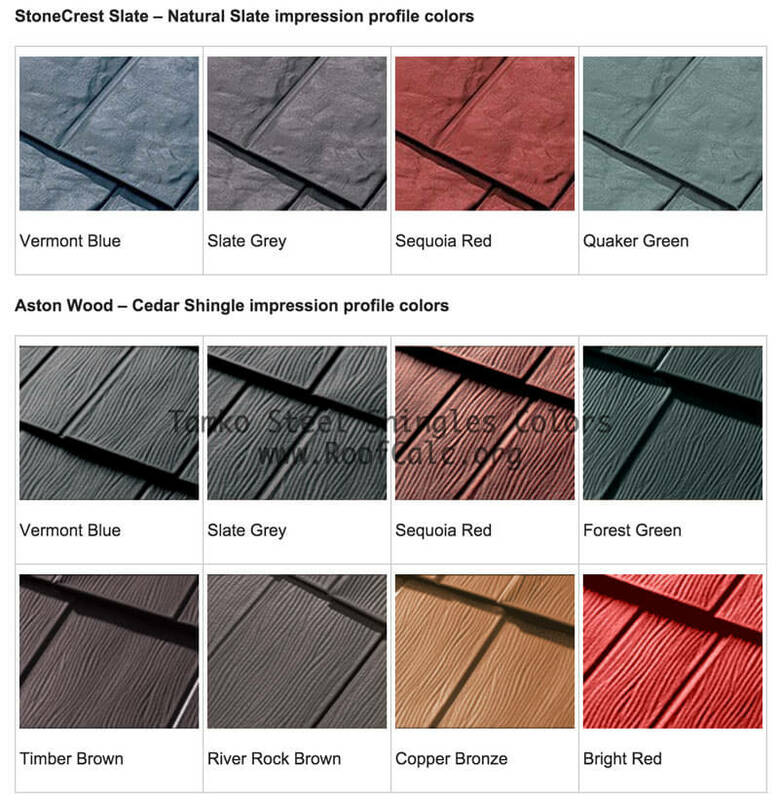 Moreover, standard colors can also vary depending on the roof’s profile. 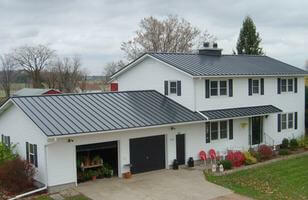 For example, standard metal roofing paint for standing seam may not be the same as the standard used for metal shake. This means that your best bet is to first look online and then request catalogs from manufacturers whose colors you found appealing. There is a selection of regularly available premium shades for different profiles. You can even chose from multi-tone mixes that very closely resemble Aged Copper, Natural Bronze, etc. These custom color will cost 10-15% more than standard options. 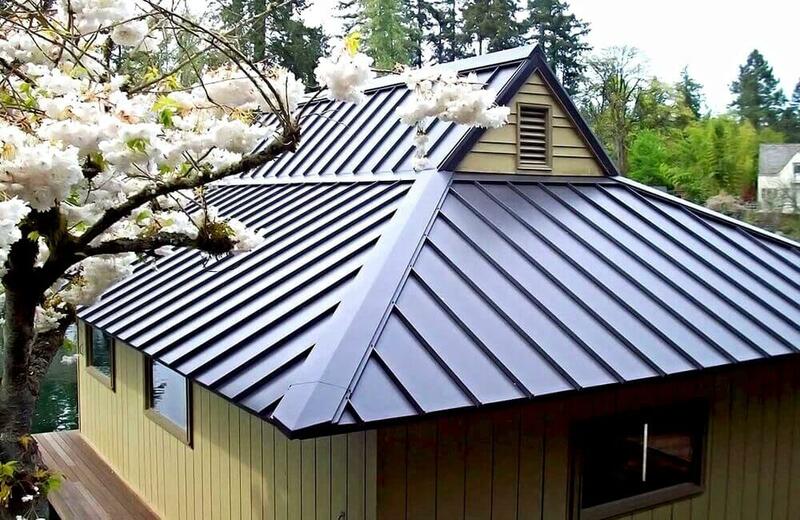 This is fairly new technology that allows the metal roof coating to combine two tones of color, producing a dimensional and sophisticated look. You may find that the selection of the two-toned options is still limited, but it is growing daily, as manufacturers master the process. If you are interested in these trendy colors, contact a few different companies to take a look at their selection. One manufacturer that does a spectacular job with this technology is EDCO. 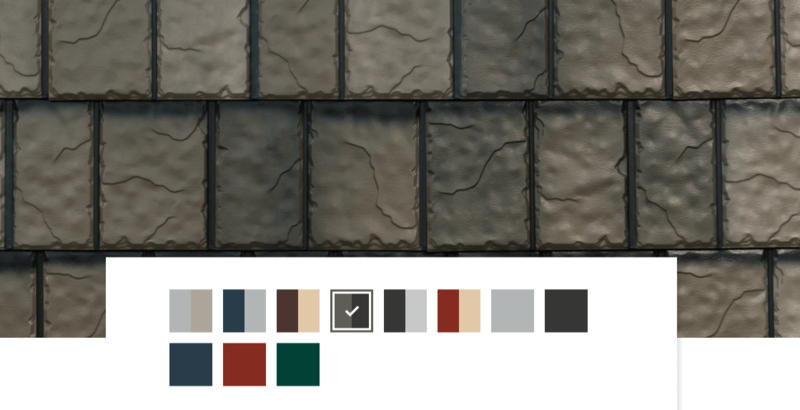 Their steel roof colors realistically replicate wood shake and slate. 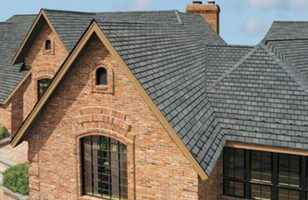 Here is an example of their gorgeous ArowLine Slate Roofing product line. Another manufacturer, pioneering two-tone colors is Matterhorn. 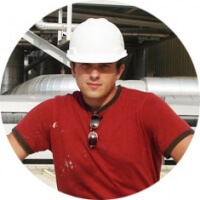 While the company is a new player in the field, they have been recently acquired by CertainTeed, so they have a highly reputable, building products manufacturer standing behind their products. Matterhorn has come out with unique and beautiful lines of Metal Shake and Metal Slate that are sure to turn heads. Looking at this roof, very few people would be able to tell its metal! Here is a sample of their options. You can choose from 4 shades that closely replicate the stages of color changes on a real cedar shake roof, from rich browns to the famous silver-grey tones. Who said that a metal roof needs to painted? Plenty of people enjoy look of bare metal, and for good reasons. Especially on modern style homes and on the standing seam profile, this option is very attractive. Aluminum, steel, copper, and zinc each have a distinct look that can rival the beauty of any painted color. 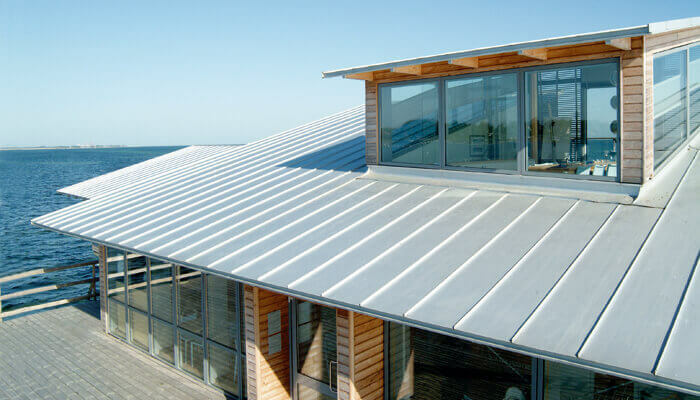 Here is an example of an unpainted steel roof on a contemporary beach house. If you have your heart set on a special color metal that is not readily available, it can be custom made. In fact, options are virtually limitless and include custom levels of shininess or gloss. These come with a premium price tag, but may be well worth the cost given the length of time this roof will be on your home. Note, that the extra cost will depend greatly on the size of the job. There needs to be a minimum quantity of material for which a manufacturer would be willing to produce the custom order. The larger your metal roof, the more reasonable the extra cost will be. Your installer can help you figure out exactly how much you can expect to spend to put a custom color on your roof. While your roof will last at least 50 years, the painted color coating may last a lot less, depending on the quality you choose. Cheaper, lower quality paint is not treated to block ultraviolet light. Therefore, it will not stand up well to the elements over the years, and will eventually chip and fade. The good news is that you can repaint it once you feel it has lost its original curb appeal. However, if you don’t want to go through the hassle and extra costs of repainting every 10-15 years, you can select a premium quality coating. It will remain looking like new for years to come. Moreover, it will protect your roof from the sun, moisture and mildew; the elements most responsible for affecting how the color looks over the long haul. The two most common metal roof coatings available are SMP (budget) and Kynar 500 (premium). Lets take a look at each to understand the difference in quality. This coating is made of Siliconized Modified Polyester (SMP). 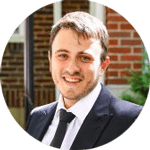 While it is not the industry’s leader when it comes to protection against fading and chalking, one major benefit is that it is not easily scratched during handling. Field testing shows that SMP coatings start to fade and chalk after 10-12 years. Weathering signs may appear even sooner in harsher climates, such as those with high sun and wind exposure. 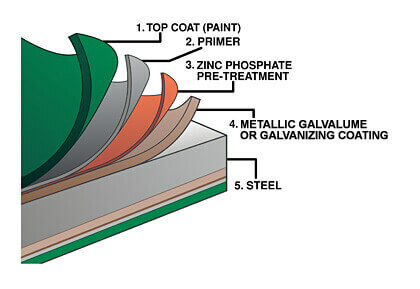 In the residential roofing industry, SMP coatings are positioned as a viable, budget friendly alternative to Kynar 500. Kynar coating is made of high-performance fluoropolymer resin, and is used to protect both aluminum and steel. Kynar is the top choice for most architects and builders, as it provides superior durability and protects your color against chalking and fading. Kynar paint typically comes with a 30 year warranty and outlast the competition in terms of gloss and color retention over time. Roof paint’s resistance to fading comes primarily from the type of pigments used. Ceramic pigments are the best at holding color. They are made from metal oxides, which are fused under high temperatures, making them the most chemically stable and therefore fade resistant. However, these pigments are also the most expensive, which means that they are not going to be found in abundance in cheaper coatings. 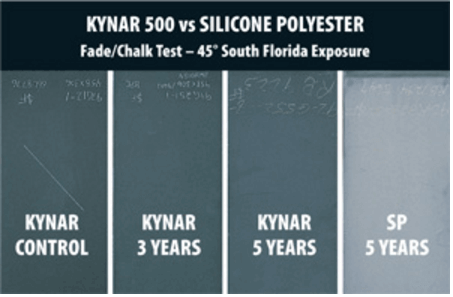 Kynar 500 is made up of ceramic pigments, therefore it offers superior fading protection. By contrast, SMP coatings don’t make use of ceramic pigments, and consequently fade much faster. Note, that in regions with a lot of sun (UV exposure), colors tend to fade at a faster rate than in areas where there is less sun. Moreover, dark and more saturated tones (deep blues, greens, reds, etc) will also fade faster than more muddy and light ones. Fading will also be a lot more noticeable on darker color metal than on lighter one. This issue can be attributed to the quality of resin used in a coating. SMP does not contain high quality resins, resulting in poor chalking resistance. By contrast, Kynar paint is made from the strongest possible resin, with a chemical composition that renders it completely immune to degradation from the sun’s UV rays, moisture, acids, chemicals and pollutants. Kynar coatings have been introduced to the roofing industry in the 1960’s. Since then, they have continuously been exposed to field testing in the harsh South Florida climate; notorious humidity and UV light. This makes for a solid 45 year history of testing and great performance. By contrast, new SMP coatings are introduced by manufacturers every 4-5 years. This means that many of these coatings have a performance and field testing history of no more than 10-15 years in South Florida exposure. However, to make attract consumers, many of these products are marketed as offering the same protection as Kynar. If you are planning to install a steel roof, you should know that under the surface color you see, steel also has a special metallic coating. Each sheet of steel gets this coating on both sides, to protect against rusting. When the iron in steel is exposed to air, it oxidizes and rust forms. The coating serves as a barrier, protecting the iron from oxidation. There are two types available: Galvanized and Galvalume. This coating made of 100% zinc. Galvanized steel is available in a variety of thicknesses, depending on the final application. Because zinc is a more active metal than iron, it oxidizes first, thereby forming a protective barrier – zinc oxide. There are a number of grades available, with the highest being G-90 (contains the highest percentage of zinc). This coating is made of zinc and aluminum, where the aluminum is 55% by volume. Because of the presence of aluminum, which does not rust, Galvalume provides superior protection. Field tests have demonstrated that a Galvalume roofing is up to three times more effective in protecting against rust than Galvanized (G-90) steel. While Galvalume steel costs more, we strongly recommend it, to ensure the highest level of protection against rust. Note, aluminum roofs are not susceptible to rusting, and are therefore considered a more premium material than steel. When you consider different colors for your roof, keep in mind that your choice will have a great impact on your home’s energy efficiency. While a metal roof is already more energy efficient than asphalt shingles, you can maximize its efficiency by choosing the right color. 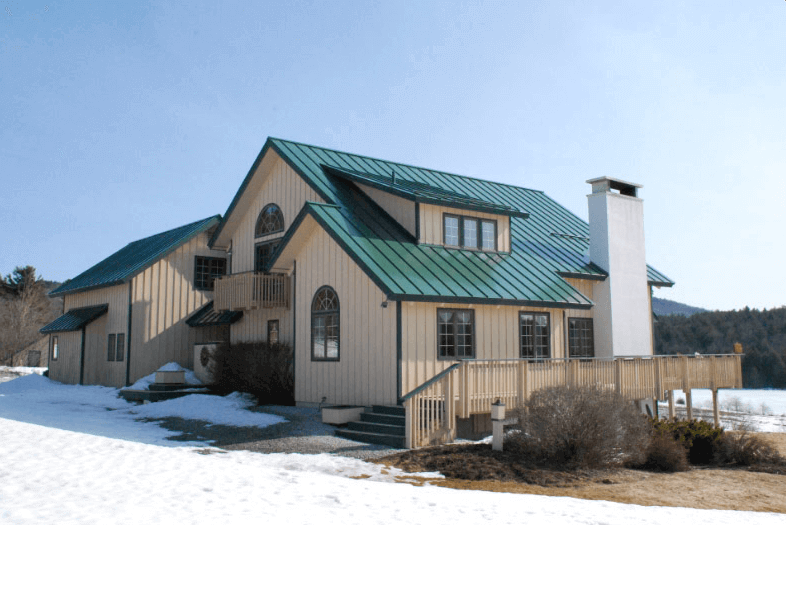 Light metal roofing colors, such as: white, beige, bronze, sand, light blue, etc., reflect the sun’s rays a lot better than darker ones, thus keeping your home cooler in the summer. 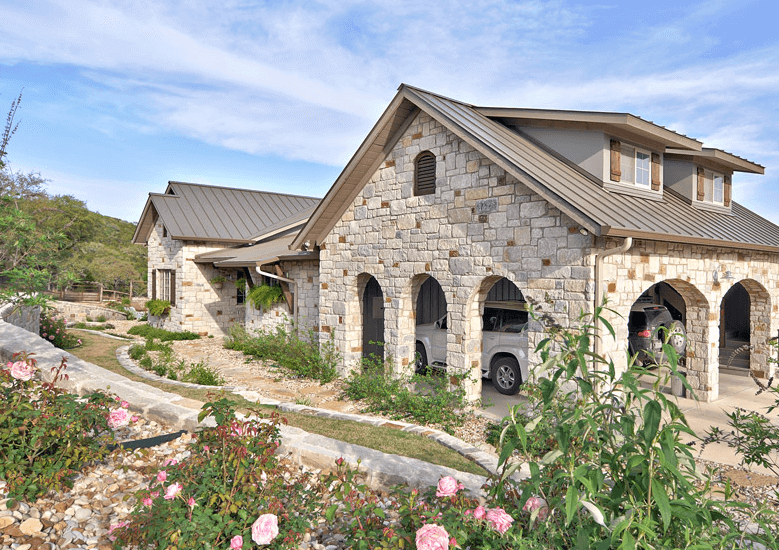 Compared to asphalt, a white metal roof can be as much as 50-60 degrees cooler in the summer! This also means that your electric bill will be significantly lower. Especially if you live in a hot climate, where your house gets a lot of sun exposure throughout the year, a light coating (white in particular) can help lower your cooling costs by as much as 15-25%. To make the right pick, it is a good idea to consult the Energy Star approved list of “cool” colors and manufacturers. 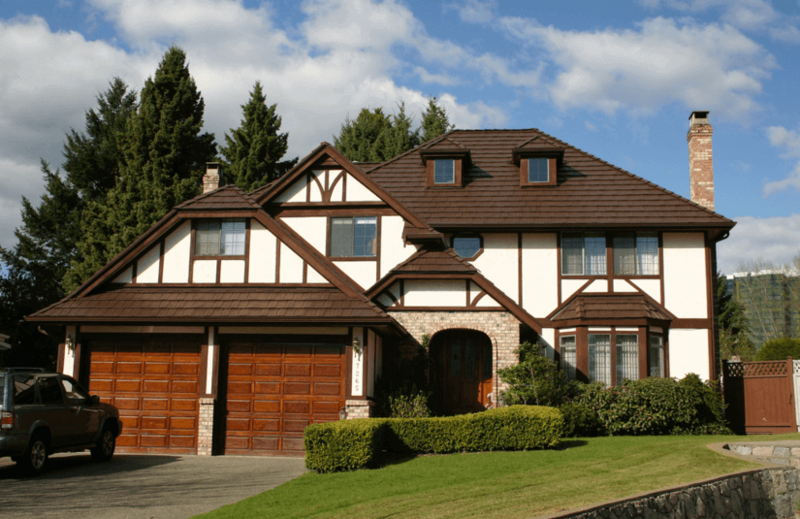 On the other hand, if you live in a cold climate, without much sun and your house is a bit cool even in the summer, it is best to select a darker tone, a brown metal roof is often a favorite. It will attract the sun’s rays and help retain heat. This will allow you save on heating costs. How to choose the best roof color? 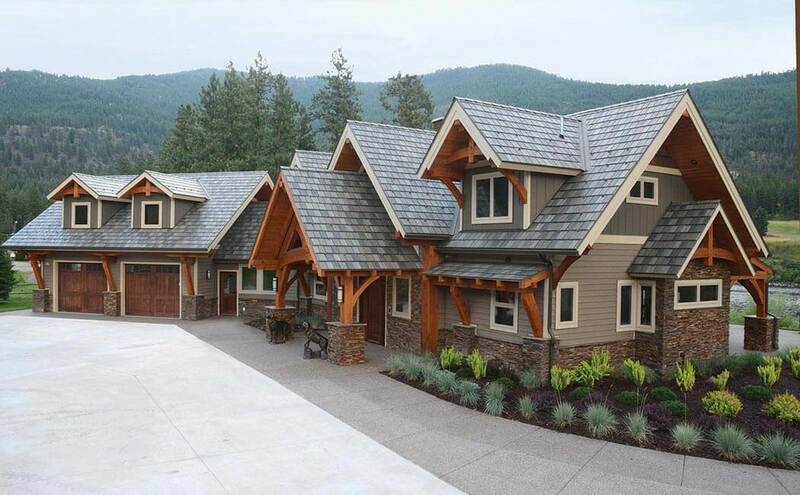 There are many beautiful roof and house color combinations. On a stone or brick home, it is critical to pick a color that will match well, as you don’t have the option to repaint your siding. In case of a metal roof, you also will not be replacing it any time soon. Consequently, try to avoid very dark or bright shades (especially if you have a large roof), as you don’t want it to be the first and the only thing that stands out about your house. You should also steer clear of overly earthly colors such as brown, as these make the entire house look heavy and boring. Instead, your best bet would be something custom. Take a careful look at your brick or stone, and consider some complementary shades. Most traditional style homes work well with both neutral and darker colors. For example, a brown metal roof is usually a very beautiful and safe choice. Unusual or very bright tones may look off -putting on a traditional style home. Contemporary: these homes may call for a bold shade to complement some unique architectural choices. For example, a black metal roof can beautiful on such a modern house. Also, as we previously discussed the look of bare metal works very well on many such homes. In recent years, installing a black metal roof has becomes a trend on many modern houses. 3. A light color roof makes the house appear taller. A light shade may be a great option, if you want your house to appear taller. Moreover, it may work well if your home has a low roof pitch. White metal roofs are a popular choice in areas that get year round exposure to sun and very hot temperatures. This is a crucial tip that many people miss. Exterior coatings, including those of your roof will look very different depending on the time of day/amount of light. Something that looks great in your living room under electric light, may look less than desirable in natural light. Take your samples and evaluate them in the sun, in the shade and at different hours of the day. Pick the one you like under most of the lighting conditions. In addition to considering the exterior colors of your house, take a look at other dominating hues in your surroundings. Are there trees around your house, a large green lawn, a lake, or a river? What colors are most of the houses and roofs in your neighborhood? Picking a similar tone will make your new roof fit right into its surroundings, instead of being an eyesore. If you want to be sure of the quality of the paint coating you are getting, look for the MCA certification stamp. MCA Certification Program has been established by the Metal Construction Association and it assists consumers in determining the quality of paint coating systems. Based on extensive laboratory as well as field testing in extreme conditions, selected products receive either the “Standard” or “Premium” stamp. In most areas of the country, MCA recommends consumers go for coatings with their “Standard” label, as these offer years of excellent performance. However, if you live in a region that gets either extreme sun, rain or wind exposure, it is advisable to select the “Premium” coatings, which have demonstrated superior performance in these conditions. Note, that MCA Certification is a voluntary program, and not all manufacturers choose to stamp their products, even if they meet the quality criteria. If you are interested in a product that does not have the MCA stamp, you should contact the manufacturer and request detailed information about the coating’s longevity and durability. 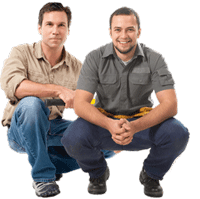 Your installer may also provide helpful advice based on his own experience with a variety of products from different manufacturers. I would like to HC-16 Panel 22 Gauge Steel 0.040 Aluminum 12 length,in your store/company i would be happy if you can get back to me again with the prices and dimensions you having available in a moment,and also do you take all types of Credit Cards as your payment required?Kindly get back to me here or on phone so that we will work together as one panther.All the best and stay blessed. Our house is a 30 year old cypress wood framed house & we are thinking of putting a metal roof on. I’m really confused in what color to go with. I’m not really big on the bold colors. My husband suggested the silver. What do you think? I’ve been considering getting a metal roof for my home. It’s good to know that it can come in several different colors and styles. I really like the look of the forest green one. I think that would end up looking great on my house. A two toned roof would look great for adding more dimension and interest too, like you said. We have a red brick ranch style house with dark green shutters. what are my color options? Which do you think would be the better pick? I think Red, Brown or Grey will work pretty well with brick. Also If you go with a metal shingle type roof, you can get Grey or Patina Green color in Slate profile. With that, the only thing is green shutters – that just doesn’t look good in my opinion, but it’s your home, so your decision. I have a brick ranch style home. The bricks are a mixture of red, peach, and dark charcoal. We would love to save energy and make the appearance of the ceiling with Light Stone. Would that look alright on our home? Should I choose a dark color instead? My house is brown. Like crayola brown. What do I put on the roof? My husband and I have been wanting a metal roof for our home, but we can’t seem to decide on what color we want. That is a good idea to request some catalogs from different manufacturers and see which colors are most appealing. Different manufacturers may have different colors we might not have seen before. Thank you for the information! I have to admit this is one heck of an article! There’s nothing like a brand new metal roof. Do lighter colors like white show mold and algae or dirt compared to silver or other colors? All colors may show mold and algae. However, those don’t grow well on metal, unless you are in really wooded area, with very humid air, and not much sun on your roof. Mold and algae are usually dirty beige/brown color, sometimes greenish… so light brown color is best (in my opinion) to “mask” mold and algae. However, I think best is to trim tree branches over the roof, to expose it to sun. Wow, I didn’t realize that a light shade of roof can make a house appear taller. My home has a low roof pitch, and the current roof has been leaking a lot lately. Perhaps I should look into getting steel roofing with a light shade when I get it repaired. Trying to find an answer to this one question . I have searched and searched and only get varied percentages based on shingle vs metal. 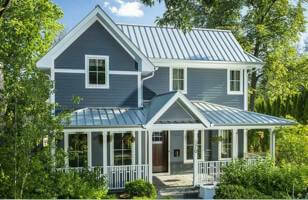 Question: How much in $$$$ would be saved choosing a metal roof in Ocean Blue vs Linen White. I have researched and seen the reflectivity stats. For instance the blue might be 0.23 and the white 0.73 but what does that equate to in dollars. I live in south Florida. Thank you so much. First – no one can answer that question, because of so many OTHER variables that affect savings on energy use. For example – poor wall insulation, leaky windows, poor roof insulation/ventilation, etc. Each house is different, and each town has different electric rates, and AC usage habits differ. Therefore – you pretty much cannot calculate savings for a particular individual. 1 – both colors are very much energy efficient. 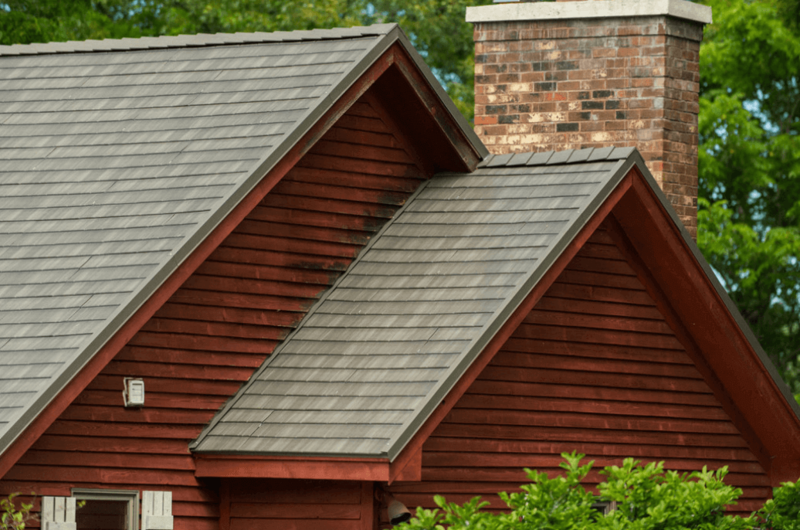 2 – a metal roof is considerably more efficient than asphalt shingles BECAUSE it dissipates heat very fast and does not STORE it (doesn’t act as thermal mass), unlike asphalt shingles. This means that after the sun goes down, the heat is “cut off”. With shingles, the roof continues to transfer heat inside the house for hours after the sun goes down. 3 – there is usually 1/8″ to 1/4″ gap between metal and roof deck, and this space prevents a lot of heat transfer to the attic. Given all of the above, it doesn’t much matter what the actual reflectivity of a “cool roof” paint is – its very efficient. Bottom line – choose the color that you like. Thanks for the tips on choosing a metal roof! 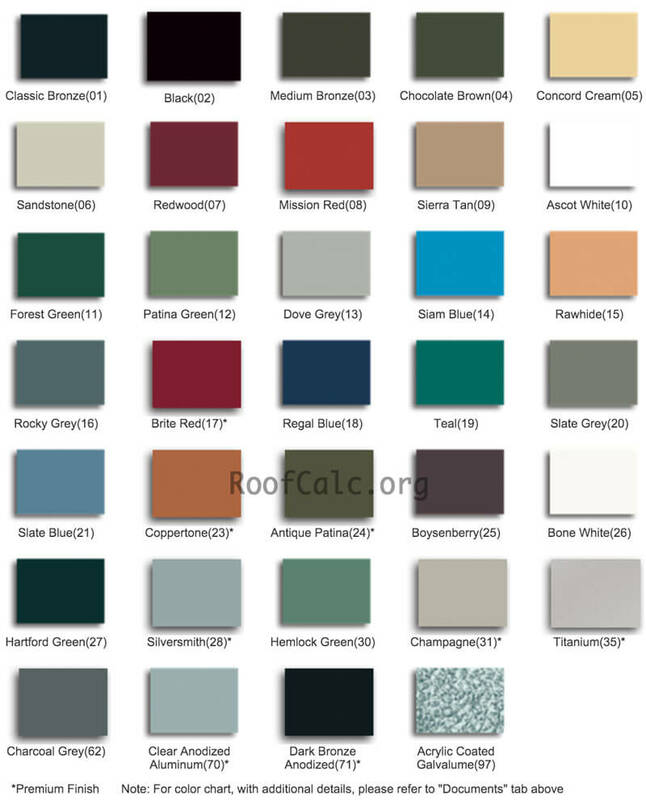 My wife and I are going to have a metal roof put in this year, but we haven’t decided which color to use! I like that you mentioned that bare metal coloring is a good option for modern homes. My wife and I are going for a modern vibe, so this might be a perfect choice for us. 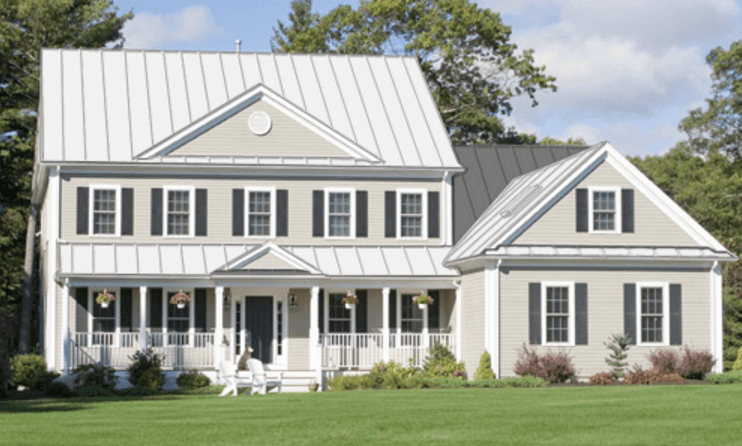 Many people are afraid that a metal roof won’t match their home as they have a misconception that with metal roofs there are less choices of colors. The fact is that modern metal roofs are available in wide variety of designs, shapes, colors and textures. 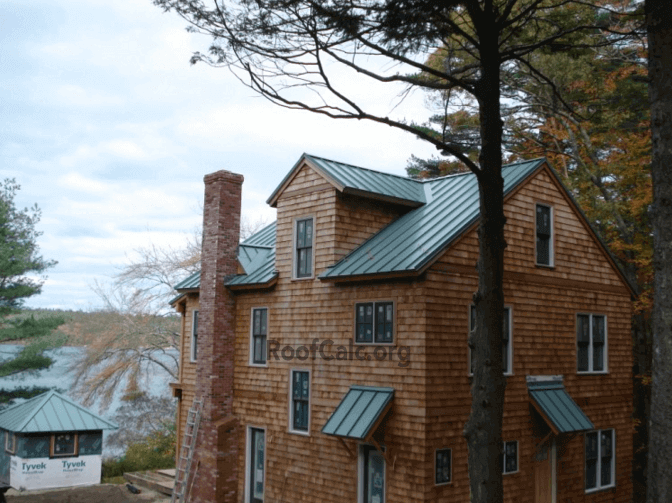 This post is definitely going to clear out many misconceptions about metal roofing and thus is worth reading. I often have queries regarding the paint on metal roofs and I also suggest that they look for quality paints instead of low quality ones. Saving on paint can lead to high cost repairs sooner or later. Thanks for pointing out some of the traditional styles, like french country, and the roof types that go with them. I can definitely see how a bright red roof might detract from the rustic feel of a french country home. I would imagine that hiring a contractor to paint your metal roof would be a good idea, since they would probably have some good advice on this subject. The idea of a metal roof sounds very nice to me, I love the idea of very little maintenance. I guess it is very important to find a color that goes well with the rest of the house. I like the photo of the white house with the brown roof, it goes very well with each other and is simple. We are a roofing construction company in Africa.We roof mostly using decra tiles and we are interested in your products in Africa.